Do you still use Google Docs to create invoices for your clients? Or generate dull invoices with PayPal? Then it’s time for an upgrade because you might be the only one who’s still using those stone age methods to generate invoices. Whether you’re a freelancer, small business, or a corporate giant, generating invoices for your clients is one of the most important parts of doing business. Yes, it’s a small, boring task and it’s easy enough to put together a simple invoice using Google Docs or MS Word and just be done with it. But, clients can tell a lot about your business through your invoices. Because an invoice is not just about record keeping, it’s also a great way to show off professionalism, impress your clients, and build your personal brand. Generating beautiful and professional looking invoices is not that difficult. There are plenty of online tools you can use to do just that. If you’re new in business or looking for an invoicing upgrade, here are four of the best invoicing tools you can use to generate stylish invoices with just a few clicks. Wouldn’t it be amazing if you could generate an invoice that tracks and include your hours, showcase your brand, and even let your clients pay directly on your invoice? Well, that’s exactly what Invoicely does. Invoicely is a popular online invoicing tool, mostly used by freelancers, individuals, and small businesses. With Invoicely, you can not only create professional looking invoices with your custom branding, but you can also accept payments directly on your invoice via PayPal, Stripe, WePay, Authorize.net, and more. Invoicely also allows you to track your hours, miles and expenses in your invoices, which is a perfect feature for freelancers working by the hour. You can also customize the invoices however you like to showcase your brand and keep records of your finances all in one place. You can use Invoicely absolutely free to generate unlimited invoices. However, if you switch to the $9.99 per month premium plan, you can get rid of the Invoicely branding from your invoices and accept payments from many payment processors other than PayPal and use advanced features like time tracking and send quotes to your potential customers. Xero is more of an advanced invoicing tool used by over 700,000 small businesses, accountants, and bookkeepers. And it’s more than just about invoicing. Xero is an all-in-one accounting software, where you can generate invoices, manage your business financials, keep track of your bank transactions, and track your employee payroll information. Generating invoices is quite easy with Xero. 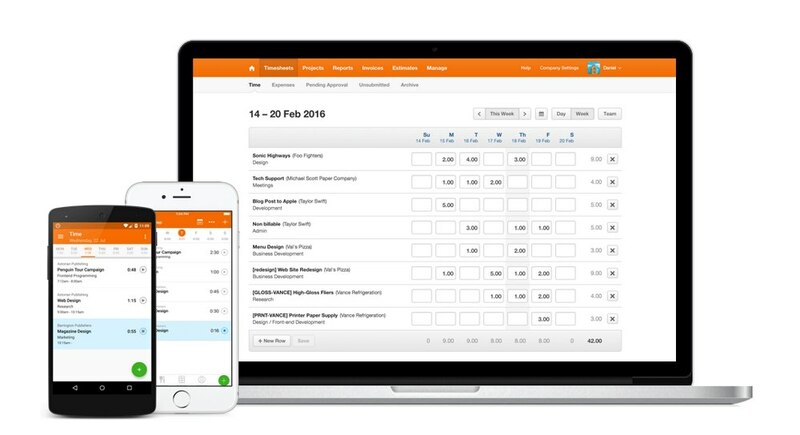 The platform even allows you to create recurring invoices for your long-term clients. The smart Invoice Reminders feature on Xero will also allow you to send reminders to your clients regarding due and overdue payments. Similar to Invoicely, Xero can also accept payments on invoices via payment processors such as PayPal and Stripe. And it has a set of mobile apps to make things easier for you to generate invoices on-the-go. Xero’s pricing plans start at $20 per month for sending 5 invoices and track 5 bills per month. The $30 per month plan will give you unlimited access to invoices, bills, and bank transactions. If you’re interested, you can test the platform by signing up for the 30-day free trial. 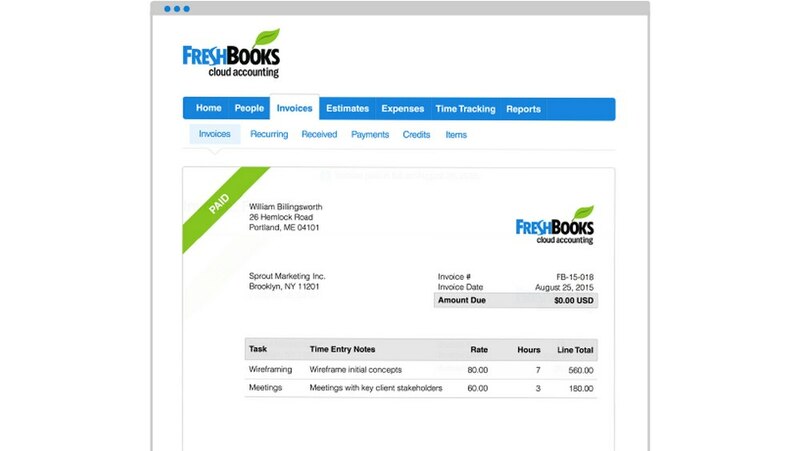 Freshbooks is one of the oldest accounting software available today with a history that goes back to 2000. Millions of users are currently using this platform to generate invoices and Freshbooks claims to have a 97.3% customer satisfaction score. Basically, Freshbooks is like a combination of both Invoicely and Xero. This software mixes the best features of both those platforms into one place by allowing you to generate invoices with time tracking and even keep track of your spendings with automatic bank imports and expense reports. FreshBooks also has a built-in payment processor, which lets you accept credit card payments from your clients on your invoices (only available in the US and Canada). Or you can connect PayPal, Stripe, or Authorize.net to accept payments as well. Freshbooks pricing plans start at $12.95 per month, which lets you generate unlimited invoices and bill up to 5 clients per month. You can bill up to 20 clients with its $19.95 per month plan and 200 clients with the $29.95 per month plan. Harvest is a time-tracking software trusted by over 40,000 businesses around the world. So far, the software has helped businesses track over 400 million hours and receive $13 billion dollars from paid invoices. The software is mainly centered around its time-tracking features, which makes it ideal for freelancers and businesses that keep track of their employees. 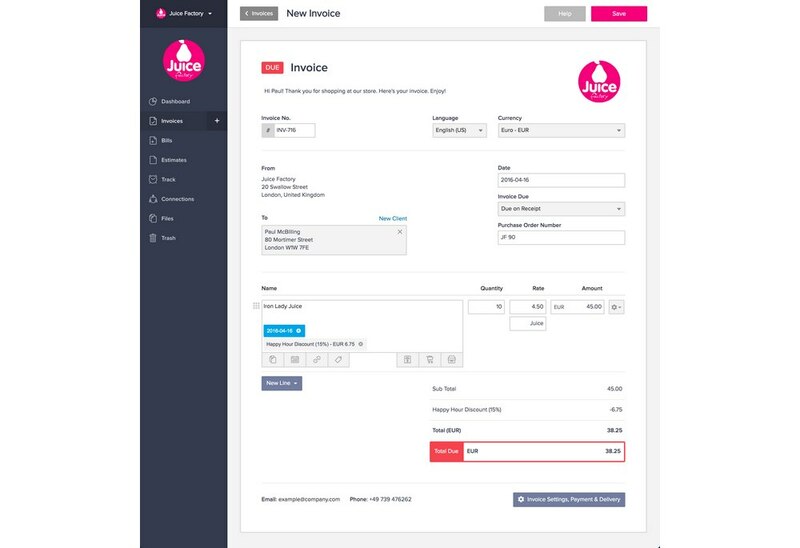 Harvest also allows you to generate invoices, although the invoice template designs on this platform are not as stylish as the ones from Invoicely and Freshbooks. Harvest will come in handy when you have to track multiple projects, set hourly or fee-based budgets, and generate invoices at the same time. Harvest can also be connected with PayPal or Stripe to accept payments on invoices. The software also supports a number of other apps for adding more features, including Forecast, which helps you to plan and schedule teams across your projects. Harvest comes with a free plan, which lets you work with up to 4 clients and 2 projects per month. The $12 per month plan allows unlimited clients and projects. If you’re a small business managing a team of 5 employees, the $49 per month will be the ideal choice. So, which one’s the best software in the list? Well, it depends on the type of business you manage. For freelancers and individual business owners, Invoicely and Harvest are the best options, especially since they come with free plans and time tracking features. For small businesses, Xero and Freshbooks will prove more useful since both platforms offer better accounting features and expense reports. Keep in mind that invoices are more of a part of your service than just getting paid on time. Investing a few bucks on improving the way you generate invoices will award you well in the long run.